The beaches, canals, docks, parks, backyards, lakes, sandbars... throughout Broward and Miami Dade counties. My services are provided on a reward basis. For me to come out and reunite you with what you have lost, you pay me what you feel is a fair compensation that you can afford. I will dedicate the time needed to find your item and you will not regret your decision to call me. In the very unlikely scenario where I don’t locate your item, I require a $25 fee for my time, gas, tolls and parking..Fee varies for scuba/deep water recoveries. On land or in water up to 20 feet(Scuba certified). Primary recovery areas include beaches, docks, parks and yards. I have over a 90% recovery success rate in the water and 100% on land. I find most people’s jewelry in under an hour and the smiles, hugs and gratitude of those that I have helped, make this job very rewarding. Remember that the key to a successful recovery is to mark the area where you lost the item and call me quickly. As a reliable, trustworthy, and experienced recovery specialist, I specialize in making your day better by turning the stress that you are feeling about your lost item into a rush of excitement when you see it again. 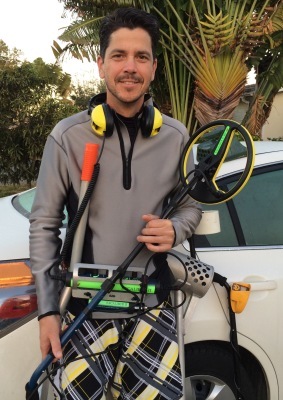 Having high quality equipment for both land and water, gives me the power to put a smile on your face so call me! Even if I am detecting in the ocean, I check my messages very often.